What Is the Pre-Tysabri JC Virus Antibody Test? The JC virus antibody test, also called the Stratify JCV, is often performed before someone with multiple sclerosis (MS) is prescribed the drug Tysabri (natalizumab), which is a disease-modifying drug used to prevent relapse in people with MS. That's because Tysabri may increase the risk of a rare viral disease of the brain called progressive multifocal leukoencephalopathy (PML). The JC virus antibody test can help doctors assess the risk that someone will develop PML. PML is caused by the John Cunningham virus (JC virus), a common, opportunistic viral infection that is normally kept under control by the immune system—so much so that around 70 percent of the U.S. population is infected with the JC virus without even knowing it. It's only when your immune system is compromised that the virus causes disease. In MS, immunosuppression is caused not by the disease itself, but by certain medications used to treat it. These medications include Tysabri, Tecfidera (dimethyl fumarate), and corticosteroids. When reactivated, the JC virus can pass through the blood-brain barrier, which separates the central nervous system from the rest of the body. PML may then develop, resulting in damage to the outer coating of nerve cells. Resulting inflammation of the brain can be serious and potentially life-threatening. There are no specific anti-viral drugs for the JC virus, nor cures for PML (though it can be treated). PML is fatal within a few months of diagnosis between 30 and 50 percent of the time. Antibodies are produced by the immune system in response to things that cause disease, such as bacteria or viruses, like the JC virus. Each antibody is specific to one disease-causing agent, or pathogen. Once your immune system creates an antibody, it stays in your system in case you run into that pathogen again. Doctors can test for specific antibodies, which serve as markers that a pathogen was in the body at some point, if not at present. The JC antibody test detects antibodies that are specific to this particular virus. A very small percentage of people who take Tysabri will develop PMG. But given the seriousness of the condition, the JC virus antibody test is important for patients taking the drug for more than two years, as it can determine if the risk is there. Risk of PML is also increased in people with past or current exposure to other immune suppressive drugs (such as azathioprine, cyclophosphamide, dimethyl fumarate, methotrexate, mitoxantrone, or mycophenolate mofetil). The JC antivirus test is performed on blood, which is collected via a needle. Blood tests like this have a low risk of complications. Typically, you'll feel a little pain when the needle pierces your skin and may have a small bruise develop afterward. Some people may get dizzy, nauseous, and experience ringing in the ears from the needle stick. Usually, it just takes resting for a few minutes and a drink of water to feel better. People taking blood thinners may get larger bruises. If you're on one of these medications, let the person drawing your blood know so they can take extra precautions. The blood draw can be performed at many labs and doctors' offices, and it usually takes only a few minutes. Be sure to follow any instructions you're given about preparing for the test, although there usually aren't any. You may want to come well hydrated, as it can make drawing blood easier. If you're nervous about needles, you may want to consider whether it's a good idea to eat right before. You'll need to expose much of your arm for the test, so wear short sleeves or sleeves that can be pushed up easily. Be sure to take your insurance information with you to the testing facility. Check with your insurance company to see whether you'll face out-of-pocket charges for this test. 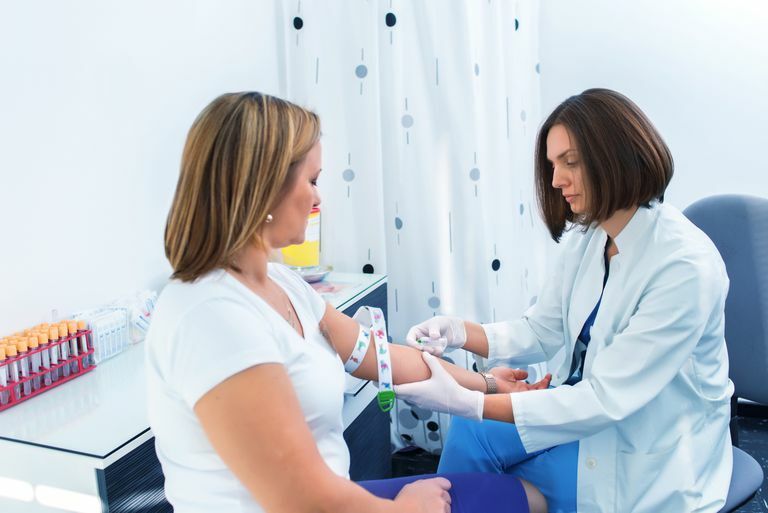 A blood draw is a fairly simple procedure—one you're likely already familiar with. The person drawing your blood will tie a band around your arm to trap more blood into your veins. They'll then clean the area with alcohol. You may be asked to pump your fist to help get your veins to stand out. Once the needle is inserted, the band may be removed to get your blood moving again. Depending on how much blood is needed, the nurse or technician may change vials on the needle midway through the draw. Once the required amount of blood is drawn, the needle will be removed and a bandage placed over the site. If you feel any negative effects from the test, let someone know. They may have you lie down until you're feeling better. If you've historically had a problem with blood tests, you may want to have someone drive you home. Negative There's no evidence of exposure to the JC virus. The challenge here, of course, is that the majority of people have been infected with the JC virus. While a positive result may suggest an increased risk of PML, it doesn't automatically mean you shouldn't take Tysabri. Rather, it allows the doctor to look at this result combined with other risk factors to decide whether Tysabri is a good treatment for you or if another option may be better. The JC virus antibody test delivers a false-negative result 3 percent of the time, so the test is often repeated after six months. Once your doctor has the results of your JC virus antibody test, you may be asked to come in to discuss treatment options. While the JC virus antibody test is helpful in determining who may be at higher risk of developing PML when using Tysabri, it shouldn't undermine the importance of the drug in the prevention of MS relapse. In the end, the decision whether to use Tysabri or not is an individual one and should be made in consultation with a specialist. If treatment is prescribed, regular follow-ups are essential to not only monitor the effectiveness of treatment but avoid any possible side effects. Gorelik L, Lerner M, Bixler S, et al. Anti-JC virus antibodies: implications for PML risk stratification. Annals of Neurology. 2010; 68(3):295-303. doi: 10.1002/ana.22128. I'm on Tysabri. How is PML Diagnosed?